As I stand on the train, crushed between other Londoners laden down with various bags, gym kits, laptops, shoe changes, make up and other every day essentials, I one day started to wonder whether my rucksack full of food in addition to the aforementioned items was representative of a standard London lunch. The following day, I took a picture of my lunch and posted it on Facebook, for a sense of affirmation that everyone else ate as much for lunch as I do. The response I received, appeared to indicate apparently not. So I posted again the following Monday, as these tend to be high Tupperwear intensity days. 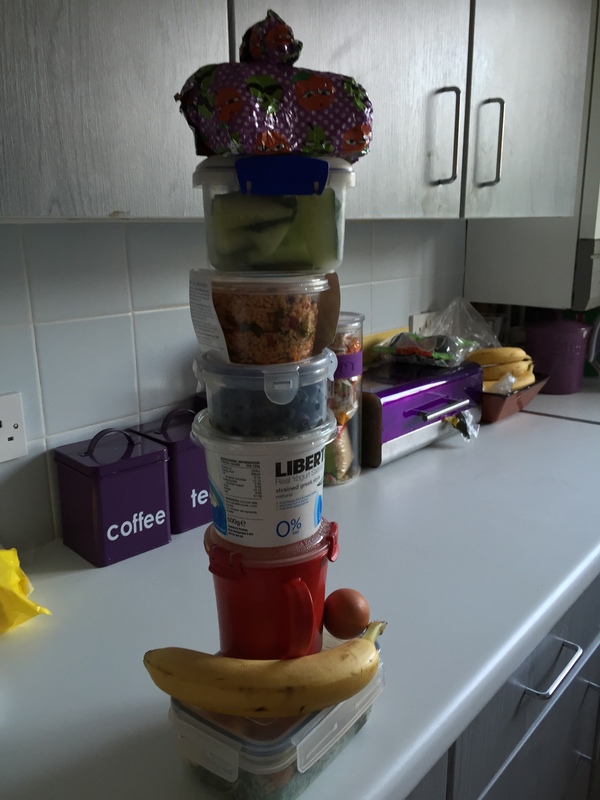 Again, positive responses and intrigued friends enquiring as to contents of said, generic, plastic food containers. (Please note that the use of the word Tupperware is as a generic brand and purely synonym for food container, rather than any particular endorsement of the Tupperware brand over others. 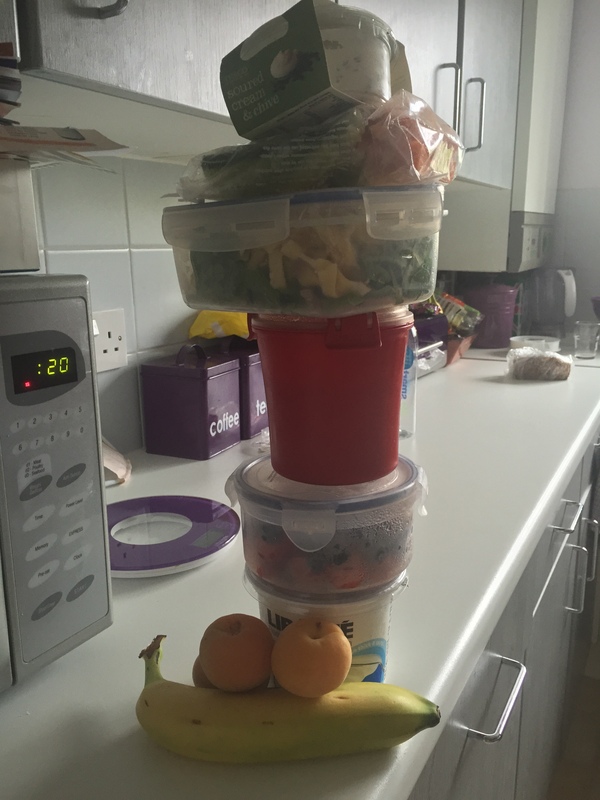 It seems that others do eat less than me for lunch on most given days, since my towering plastic stack does not even stand for the totality of my daily food consumption. Porridge, breakfast biscuits, nuts and chocolate are in my desk drawer / storage cabinet. I like to claim that this is amplified lunch stash is due to the fact that I tend to eat my breakfast, lunch and dinner at work. 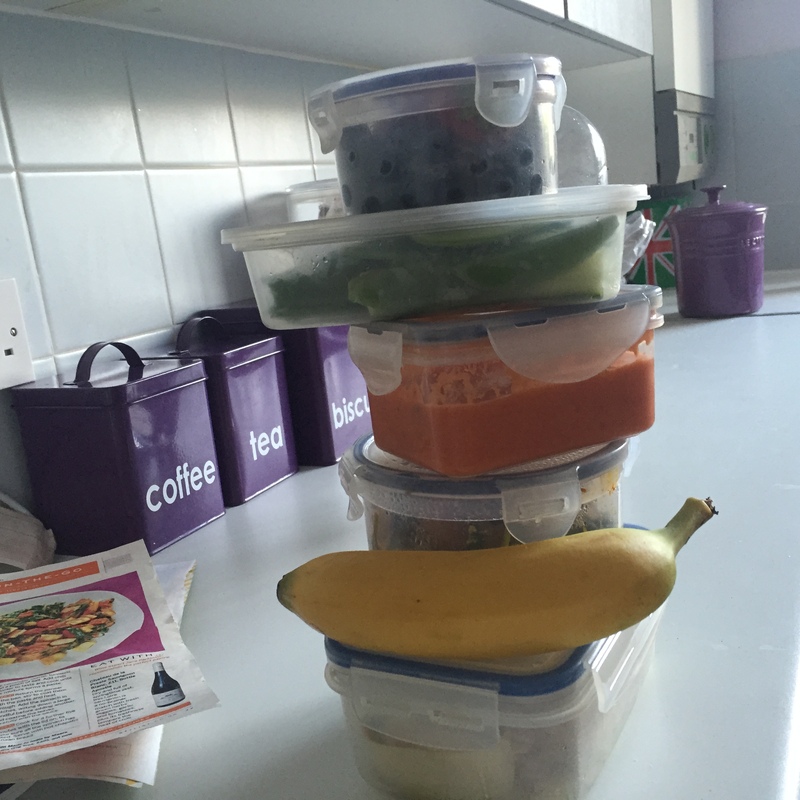 As an ex-colleague and healthy living ninja consultant friend of mine, Sarah, sighed, at least if you have to eat dinner at your desk it is home made. I don’t always get time to leave the office during the day, and the fear of not having sufficient snacks to banish any hunger pangs during the day feels me with an even greater fear than having to stand the entire commute from Tooting to Blackfriars (how on earth would I put my make up on then!?). – Other afternoon snacks such as sugar snap peas and crudites to have with a dip or the odd bean salad that Will brings home from his long days away. I cook or prepare most of the more time-consuming elements of this ensemble on a Sunday night, in order to last me the week. Store cupboard staples such as porridge, popcorn, breakfast biscuits (e.g. Belvita), and chocolate in addition to the above are kept at work. What do you eat for lunch in the office? I’d love to share recipe ideas! whats this weekend’s ‘baking activities’? Amazing how you keep your size 8/10 figure with that little lot! Good on you!